As a parent, it is extremely important to talk to your kids about food and teach them healthy choices early in life so they can make their own healthy choices as they grow. It's also important to be involved and up to speed about what they are eating when they aren't with you, e.g., school lunchtime. 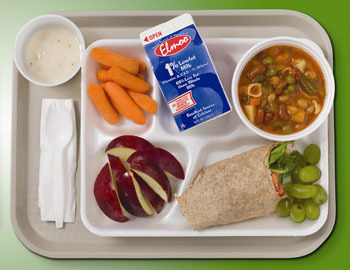 School lunches are bulking up nutritionally as of lately. Because of recent changes in the USDA's dietary standards for school lunches, school districts are having to change their menu choices. 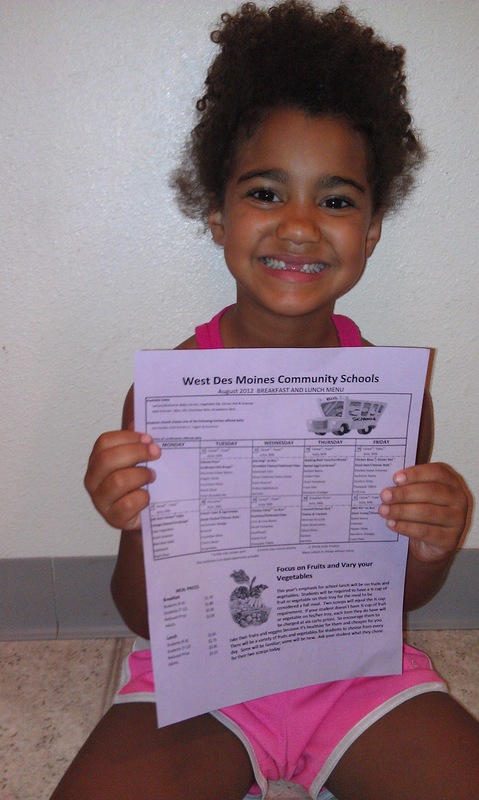 Our district implemented more whole grains and more fruit and vegetable choices everyday. Such a great step in the right direction. You can read in more detail about the changes and specifications here. But just because the school serves it, doesn't mean the child will eat it. That's why it's important to be active and knowledgeable about what they ate while at school. Every evening I read the menu to Kaydin and every morning I read it again in case she's changed her mind about what she'd like to eat. She also tells me what she did and didn't eat for the day. Everyday after school I ask her what she finished and what she tried. We are implementing a sticker system where she gets a sticker when she tries and finishes her vegetables. The kid will eat most any fruit you put in front of her- and a lot of vegetables. But there is a list of some veggies she doesn't like. We're working on changing that. Today she tried and finished her corn and lima beans! Even though she thinks she doesn't like a certain food, we still encourage her to try them occasionally. Just because a food wasn't loved at three years old doesn't mean their tastes didn't change and they won't like it at six years old. Reintroduce foods periodically and they may surprise you and actually like it! It's also important not to force them. Yesterday Kaydin decided it was a cold lunch day. I offered her broccoli along with her other choices so she could try to earn a sticker. She declined. I was ok with that, though, because of the other healthy choices I stocked her lunch bag with. She just lost out on her chance for her sticker for the day. If you push too hard, it may turn the child off from being adventurous and trying new things on their own. Simple steps taken by you as the parent can help foster your child into healthy habits. Stay tuned for some lunchbox ideas!